So, Fenneca Lea, being a universal victim, gets subjected to a lot of transformations in the course of being brainwashed, hypnotized, mind controlled, etc... And here's a few of them! On the left is normal Fen! She's such a cutie! But make no mistake, Fen's a smart, skilled, and competent Freedom Fighter. She was just born under a bad sign. It probably read "Dead End." In the middle, we have Legion Fen, subjected to the Legionization process, which involves cybernetic implants and heavy brainwashing. Her left arm contains a forearm blade, and a blaster in the palm. Her feet have jump-jets in them... and she has other special stuff under her robe. >X3 Fen in this form is cold and calculating, and absolutely ruthless. 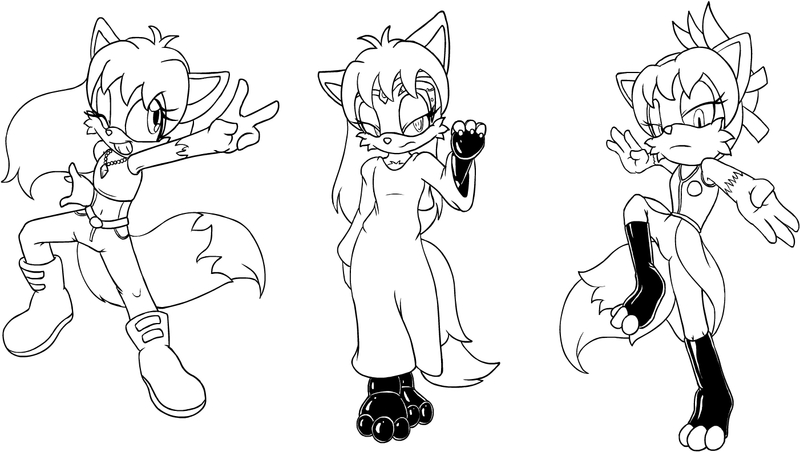 On the end is one that will appear sometime in my next main Sonic story: Iron Fen. After crossing paths with Iron Nicole 2.0, Fen finds herself reprogrammed into an obedient slave to the Iron Queen. The new clothes aren't the only changes, as she is now an emotionless nanite-empowered assassin who'll take down anyone in her path without hesitation. Oh, the one on the right seems like it will be a fun one to see.